Workers receive treatment after a mass fainting at a factory outside of Phnom Penh, Oct. 27, 2011. Hundreds of Cambodian garment workers were treated at a hospital outside of the capital after fainting during a shift on Thursday, days after an even larger group was sickened at the same factory. 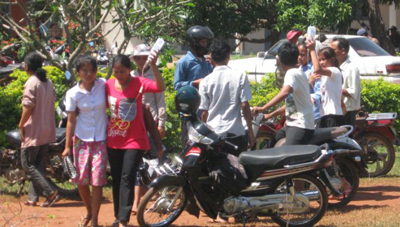 More than 200 workers from the Anful Garment Factory (Cambodia) Ltd. in southern Kampong Speu province fainted when they resumed work on Thursday. The workers had been given two days of rest by the factory management after nearly 1,000 of them fell ill on Monday. One worker, who asked to remain anonymous, said fumes in the facility caused the workers to feel nauseated and dizzy. “I smelt something disgusting and when I ate something I wanted to throw up. I felt dizzy and exhausted,” she said. The symptoms were similar to those reported by other workers who collapsed at the factory on Monday. Those workers were treated at a nearby hospital and released after three hours. Chea Mony, the leader of one of Cambodia’s biggest independent unions, the Free Trade Union, said the workers were still exhausted from the previous incident. “I have appealed to the authorities to inspect the factory because the toxic environment continues to harm the workers' health,” he said. Following Monday’s incident, Chea Mony said that the factory had been sprayed with insecticide over the weekend. Chea Sokhun, a doctor who treated the workers on Thursday, said they were exhausted due to a lack of glucose in their blood. “The environment that they work in makes it difficult for them to breath and the workers didn’t have enough strength,” he said. Cambodia’s labor department has requested the factory to allow the workers to continue being on paid leave, thoroughly clean its premises, and turn on air conditioning at least half-an-hour before shifts begin. Cambodia’s textile industry, which is the country’s third-largest currency earner after agriculture and tourism, has been rocked by more than five incidents of mass fainting in recent months and nearly a dozen in the past year. They are mostly blamed on workers' poor health, bad ventilation in the workplace, or exposure to dangerous chemicals. But factory management has blamed “strange psychological phenomena” for the mass collapses, saying they have come after a single worker cries out and faints. Many of the workers labor long hours for meager salaries which are critical for hundreds of thousands of poor rural families. In August, environmental watchdog Greenpeace said in a report from Beijing that traces of toxic chemicals harmful to the environment and to human health had been detected in products made by 14 top clothing manufacturers. Samples of clothing from top brands including Adidas, Uniqlo, Calvin Klein, H&M, Abercrombie & Fitch, Lacoste, Converse, and Ralph Lauren were found to be tainted with the chemicals, known as nonylphenol ethoxylates, the watchdog said at the launch of its report "Dirty Laundry 2." Separately, more than 100 high school students in Cambodia’s Pursat province fainted during Thursday morning classes and were taken to hospital for treatment. Student Sao Kosak, who fainted and later recovered in hospital, said he saw one student about to fall down and he tried to help, but suddenly felt dizzy himself. “I was having difficulty breathing. I felt as if there was a wind blowing and all of a sudden it hit me,” he said. Schoolteacher Moeun Tohear confirmed that classmates had tried to assist one student as she fainted, but said several others also collapsed soon after. “They were learning in class and all of a sudden they collapsed. Seven students in my classroom fainted and then we heard other students in other classrooms had also fainted,” he said. Provincial governor Kouy Sokha said that 116 students had fainted, but that nobody was seriously ill and all had recuperated. Hospital staff and local officials said the reason for the mass fainting was not immediately clear and were investigating the incident.